You should arrive on October 8 and depart on October 18. PHOTOGRAPHERS WHO LOVE LANDSCAPES AND ANIMALS IN HABITAT! Greg Basco is a resident Costa Rican professional photographer and environmentalist. He is a BBC/Veolia Wildlife Photographer of the Year and multiple Nature's Best Windland Smith Rice prizewinner, and his photos have been published by National Geographic, Outdoor Photographer, and Newsweek. His latest work is an acclaimed coffee table book on Costa Rica's natural wonders, and he is co-author of the popular e-books The Guide to Tropical Nature Photography and Lightroom for the Nature Photographer. Greg has earned a reputation as a knowledgeable workshop leader who puts his clients first. Greg does his own shooting on his own time, not yours! We will be with you every step of the way so that you take great photos and acquire new skills that will serve you on this trip and in the future. Arrival to Chile. Meet our representative at the Arturo Merino Benitez International Airport and transfer to our hotel in the heart of Santiago. If you arrive early this day, make sure to get out and stroll around the neighborhood surrounding the hotel. The vibrant business district is a pleasant place to have a coffee or do a little shopping. After an early breakfast, we head to the airport for our flight to the Calama airport. Upon arrival, we take our private bus to our hotel in a beautiful colonial town on the edge of the Chilean altiplano. After check-in at our hotel, we head downtown to the charming center of San Pedro for street and building photography with hands-on lessons related to exposure and metering. After dinner at a great local restaurant, we'll do some night shooting in town and then return to our hotel for a well-deserved rest before tomorrow's early start. We head out very early this morning for sunrise at the Red Rocks Lake and then to photograph Vicuña at one of our favorite salt lakes. Both locations are beautiful! After lunch at a local restaurant we return to our hotel for a bit of rest before our fantastic late afternoon and night shoot. We'll be visiting a series of celestial blue lagoons set in an otherworldly salt flat. We'll have time to shoot with great late afternoon light and at sunset. We'll then enjoy a typical Chilean picnic for dinner right on site and afterwards continue to photograph the lagoons with stars as night falls. This will be a truly magical experience! Today is flamingo day in the Atacama desert! After breakfast at our hotel, we head out to a highland altiplano salt lake near the Bolivian border that offers great photo opportunities of three species of flamingo as part of the landscape. It's truly a special place. We then head down from the altiplano to enjoy lunch at a local restaurant before continuing on to a second lake that offers fantastic opportunities for tighter portraits of our beautiful flamingo subjects. The sunset here is wonderful, and we can often include flamingos as part of our sunset scene. This morning we travel back to the airport and fly south to Santiago and then continue on to Patagonia. After a stop en route for dinner, we'll arrive to our hotel at night and check-in to rest up for the next day's shooting. This morning we shoot the sunrise right from our hotel and then have breakfast before heading out on our first Patagonian adventure. We'll take the morning to explore another nearby lake that offers us stunning mountain views. We return to our hotel for lunch and a bit of a rest before heading out to the Torres del Paine National Park for an area that offers us great views of the soaring mountain peaks. We can work with wide angle this afternoon but also with telephoto zooms for graphic compositions and time lapse. Throughout today and in the following days, we have hired our Patagonian friends, the best puma trackers in the world! Our local guides will be on the lookout for pumas, and we will be in constant radio contact to get you the best shot! We return to our hotel for dinner this evening. We leave very early this morning for sunrise over the stunning Laguna Amarga that offers a beautiful view of the famed Torres. We return to our lodge for lunch. In the afternoon, we will have a session on post-processing. We'll have an early dinner tonight and afterwards, head out right on the hotel grounds for sunset and night shots of the lake and the towering mountains of the national park by moonlight. Again, throughout the day, we will be on the lookout for puma. We enjoy sunrise this morning from a different overlook near our hotel that offers beautiful possibilities for reflections. After breakfast at our hotel, we take some time to photograph birds such as caracara, plant-cutters, and flycatchers in the woods near our hotel. We then depart for another section of the park that offers beautiful views. We have lunch at a very nice restaurant right on Lake Grey and then enjoy an amazing 3 hour boat ride to shoot blue icebergs and a glacier field set below the towering peaks of the Paine. It's awesome! We enjoy dinner at our hotel after this amazing day! This day is our final day to get that magical landscape shot, and we have some great spots planned for you! We'll be out all day to photograph the celestial blue waters of some nearby lakes, and we'll again be on the lookout for wildlife such as guanaco to include in our landscape photos. And as a bonus, we'll be on the lookout for the very cool Torrent Duck, which frequents the rushing rivers of the national park. This will be a busy but productive day. We return to our hotel for dinner and a chance to relax. Today we enjoy our last breakfast at our beautiful mountain hotel before heading back to the airport for our flight to Santiago. We arrive in late afternoon and have a bit of time to relax a bit before enjoying a farewell dinner with our new friends, Chilean and otherwise, in our hotel's restaurant. Walk across the sidewalk to the airport for your flights home. DSLR camera body or bodies, though mirrorless systems could work very well too. Wide angle lenses, a zoom such as a 16-35 mm for general landscape work and a fast prime lens (e.g., 14 mm f/2.8, 20 mm or 24 mm f/1.4) for night skies. A sturdy tripod (it can be windy, so we don't recommend smaller travel tripods) and a good ballhead. You do not need a gimbal head for this workshop. Graduated neutral density, neutral density, and polarizing filters, especially for your wide angle zoom lens. + Why is this trip more expensive than your other workshops? Good question. We pack a lot of diversity into our tour, we have two full-time leaders, a local photo/naturalist guide, and even specialized local puma trackers in Patagonia. Unlike other tours in Chile, we also include everything. There are no hidden costs or extras. Finally, Chile is simply quite a bit more expensive than Costa Rica or Ecuador, for instance. The cost of everything is higher, and Chile also has a high VAT tax that raises costs further. We have worked with our local Chilean partners to bring down prices as much as possible for all of us! + I see that we will be at moderately high elevations at times. Is there anything I can do to reduce the chances of altitude sickness? Good question. We will be at higher elevations for the first 4 days of this trip. Hydration, ibuprofen, and being in shape can help but altitude sickness can strike regardless of age or physical condition. The local coca leaves are a traditional preventative, and we will have these available for you. They taste OK and do not produce any narcotic effect, though they do make you feel like kind of an outlaw, which is a cool bonus! If you think you are sensitive to higher altitudes, please ask your physician about the prescription medication Diamox. In general, your best choices are lightweight garments that breathe and dry quickly, and you’ll want a mix of long sleeves and short sleeves. A sturdy polartec and a good rain/wind jacket are also good to have as well as a warm hat and gloves. For meals, it’s informal at the lodges and in the region in general. A pair of jeans, tennis shoes, and a clean shirt are just fine for dinner, even in the captial city hotels. Lightweight hiking boots are fine for our photography out in the field. We will send you clothing and photo gear information specific to this trip after you've signed up. The hotels and lodges we use offer laundry service for a cost of approximately $1-3 per garment with same or next day service. This is probably the question that our clients ask us the most. And it’s the one for which we have the least definitive answer, except to say that beer is always a safe choice! Water in Santiago is perfectly safe. The water at our hotel in the Atacama Desert is also safe. The water at our hotel in Patagonia is also considered safe, and we drink it with no problem. But, bottled water is available at the hotel bar, and we will make a grocery store stop to stock up on water and sundries. As with travel to any foreign country, immodium pills are good to have along, and some of our clients also bring along Cipro or other broad-spectrum antibiotics. Some go so far as to begin taking antibiotics before arriving in-country. For antibiotic use, we suggest you consult with your physician. That said, we have very very few problems with water and food-related issues on our tours. Did you know that the Atacama Desert is the driest place on Earth? Some areas have never received a drop of rain! You should arrive to and depart from Chile's Arturo Merino Benitez International Airport (SCL). All of our hotels and lodges have electricity and hot water. They're quite nice! They even have WiFi available. This trip requires moderate fitness. There are no long hikes involved, but you we will visit a couple of areas that are over 12,000 feet in elevation. Our highest elevation for lodging, though, will be at only about 7,000 feet. Electrical current is 220 volts and 50 Hz, so most of us will need an adapter. This is one option that we have found to work well and would serve you well in the US too. 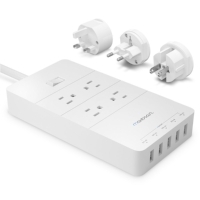 Another option is to combine a small, stackable adapter set with a US-style portable power strip. Greg Basco has used this combo in Chile (and Europe) with no problems. Travel to Chile does not require any special vaccinations or medicines, but you should be up to date on routine vaccinations. The CDC recommends being up to date on Hepatitis A and Typhoid vaccinations. We advise you to consult with your physician.